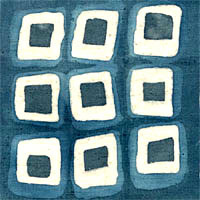 Creating these tiny wall batiks. These are all 4 x 4 “ and are mounted onto wood tiles. Right now my work table top is full and I’m waxing away. I’m particularily busy creating these guys I call “dirtybits”. I draw them in hot wax, then paint them with dye.